While the information presented below is accurate as of the date of publication, it should not be cited or relied upon as legal authority. It should not be used as a substitute for reference to the United States Bankruptcy Code (title 11, United States Code) and the Federal Rules of Bankruptcy Procedure, both of which may be reviewed at local law libraries, or to local rules of practice adopted by each bankruptcy court. Finally, this pamphlet should not substitute for the advice of competent legal counsel. Chapter 7, entitled Liquidation, contemplates an orderly, court-supervised procedure by which a trustee collects the assets of the debtor's estate, reduces them to cash, and makes distributions to creditors, subject to the debtor's right to retain certain exempt property and the rights of secured creditors. Because there is usually little or no nonexempt property in most chapter 7 cases, there may not be an actual liquidation of the debtor's assets. These cases are called "no-asset cases." A creditor holding an unsecured claim will get a distribution from the bankruptcy estate only if the case is an asset case and the creditor files a proof of claim with the bankruptcy court. In most chapter 7 cases, the debtor receives a discharge that releases the debtor from personal liability for certain dischargeable debts. The debtor normally receives a discharge just a few months after the petition is filed. Chapter 13, entitled Adjustment of Debts of an Individual With Regular Income, is designed for an individual debtor who has a regular source of income. Chapter 13 is often preferable to chapter 7 because it enables the debtor to keep a valuable asset, such as a house. It is also favored because it allows the debtor to propose a "plan" to repay creditors over time - usually three to five years. At a confirmation hearing, the court either approves or disapproves the plan, depending on whether the plan meets the Bankruptcy Code's requirements for confirmation. Chapter 13 is very different from chapter 7, since the chapter 13 debtor usually remains in possession of the property of the estate and makes payments to creditors, through the trustee, based on the debtor's anticipated income over the life of the plan. Unlike chapter 7, the debtor does not receive an immediate discharge of debts. The debtor must complete the payments required under the plan before the discharge is received. The debtor is protected from lawsuits, garnishments, and other creditor action while the plan is in effect. The discharge is also considerably broader (i.e., more debts are eliminated) under chapter 13 than the discharge under chapter 7. From an individual debtor's standpoint, one of the primary goals of filing a bankruptcy case is to obtain relief from burdensome debt. Relief is attained through the bankruptcy discharge, the purpose of which is to provide a "fresh start" to the honest debtor. Under the federal bankruptcy statute, a discharge is a release of the debtor from personal liability for certain specified types of debts. In other words, the debtor is no longer required by law to pay any debts that are discharged. The discharge operates as a permanent order directed to the creditors of the debtor that they refrain from taking any form of collection action on discharged debts, including legal action and communications with the debtor, such as telephone calls, letters, and personal contacts. The timing of the discharge varies, depending on the chapter under which the case is filed. In a chapter 7 (liquidation) case, for example, the court usually grants the discharge promptly on expiration of the time fixed for filing a complaint objecting to discharge and the time fixed for filing a motion to dismiss the case for substantial abuse (60 days following the first date set for the 341 meeting). Typically, this occurs about four months after the date the debtor files the petition with the clerk of the bankruptcy court. In chapter13 (adjustment of debts of an individual with regular income), the court grants the discharge as soon as practicable after the debtor completes all payments under the plan. A broader discharge of debts is available to a debtor in a chapter 13 case than in a chapter 7 case. As a general rule, the chapter 13 debtor is discharged from all debts provided for by the plan except certain long-term obligations (such as a home mortgage), debts for alimony or child support, debts for most government funded or guaranteed educational loans or benefit overpayments, debts arising from death or personal injury caused by driving while intoxicated or under the influence of drugs, and debts for restitution or a criminal fine included in a sentence on the debtor's conviction of a crime. DOES THE DEBTOR HAVE THE RIGHT TO A DISCHARGE? WILL FILING BANKRUPTCY AFFECT MY JOB? A governmental unit or private employer may not discriminate against a person solely because the person was a debtor, was insolvent before or during the case, or has not paid a debt that was discharged in the case. The law provides express prohibitions against discriminatory treatment of debtors by both governmental units and private employers. A governmental unit or private employer may not discriminate against a person solely because the person was a debtor, was insolvent before or during the case, or has not paid a debt that was discharged in the case. The law prohibits the following forms of governmental discrimination: terminating an employee; discriminating with respect to hiring; or denying, revoking, suspending, or declining to renew a license, franchise, or similar privilege. A private employer may not discriminate with respect to employment if the discrimination is based solely upon the bankruptcy filing. In order to qualify for relief under chapter 7 of the Bankruptcy Code, the debtor must be an individual, a partnership, or a corporation. An individual cannot file under chapter 7 or any other chapter, however, if during the preceding 180 days a prior bankruptcy petition was dismissed due to the debtor's willful failure to appear before the court or comply with orders of the court or the debtor voluntarily dismissed the previous case after creditors sought relief from the bankruptcy court to recover property upon which they hold liens. 11 U.S.C. §§ 109(g), 362(d) and (e). Any individual, even if self-employed or operating an unincorporated business, is eligible for chapter 13 relief as long as the individual's unsecured debts are less than $290,525 and secured debts are less than $871,550. 11 U.S.C. § 109(e). A corporation or partnership may not be a chapter 13 debtor. The filing of a petition under chapter 7 or chapter 13 "automatically stays" most actions against the debtor or the debtor's property. 11 U.S.C. § 362. This stay arises by operation of law and requires no judicial action. As long as the stay is in effect, creditors generally cannot initiate or continue any lawsuits, wage garnishments, or even telephone calls demanding payments. Creditors normally receive notice of the filing of the petition from the clerk. 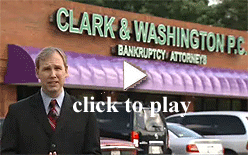 WILL FILING BANKRUPTCY PROTECT MY PROEPRTY? The automatic stay stops and prevents foreclosure, repossession, garnishments, collection calls, etc. Upon notice of the chapter 7 or chapter 7 case, creditors must cease attempting to collect from the debtor or the debtor's property until further order from the bankruptcy court. Upon the filing of the chapter 7 petition, an impartial case trustee is appointed by the United States trustee to administer the case and liquidate the debtor's nonexempt assets. The chapter 7 trustee will preside over the meeting of creditors and determine whether there are any nonexempt assets available to liquidate for the benefit of creditors. The meeting of creditors is a required, administrative hearing which allows the chapter 13 or chapter 7 trustee to ask you questions regarding your debts, assets, and finances. The confirmation hearing the hearing in a chapter 13 case where the judge approves the proposed repayment plan. After the plan is confirmed, the trustee will begin making payments to the creditors who have filed claims in the case. The confirmation hearing usually takes place about a month after the meeting of creditors. You should list anybody and everybody that you might owe money or who might assert a claim of any kind against you. This includes taxes, child support, student loans, credit cards, medical bills, utilities, mortgages, car loans, finance companies, credit unions, etc. They might not all be treated the same in your case, and some might not be discharged, but every one of your creditors should be listed. For your convenience we have provided our intake form that you can print and complete at your convenience. Please fill in the information as completely as possible. Be sure to list each and every one of your creditors. Then, call our office and make an appointment for a FREE OFFICE CONSULTATION with one of our attorneys. Of course, if you have any questions in the meantime, please do not hesitate to call.